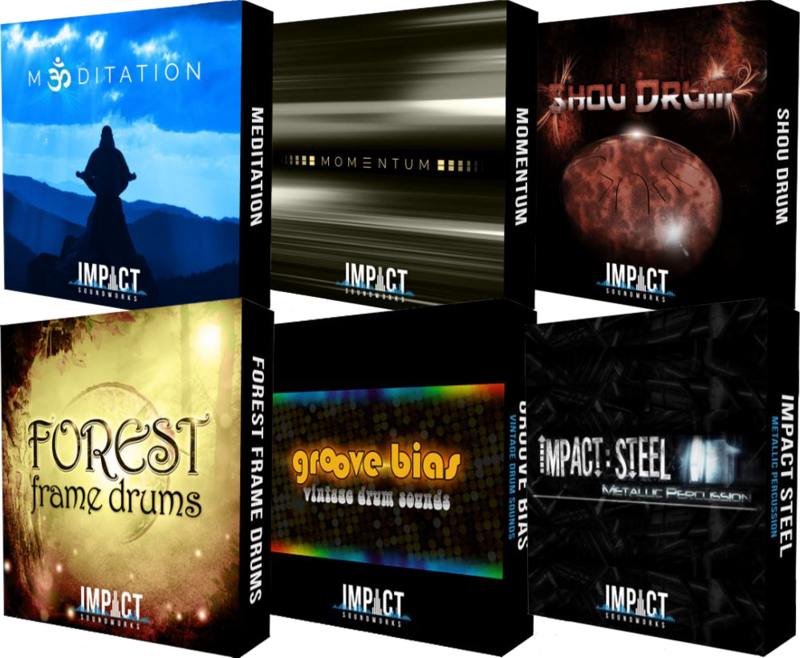 Featuring thousands of samples in total with stunning realism and instant playability, this bundle is perfect for Epic Trailer Music, Cinematic Underscore, Video Game and Ambient music! 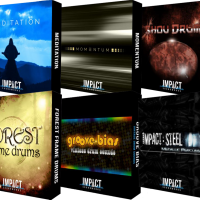 Together these libraries are perfect for producing all types of musical styles including Epic Trailer Music, Cinematic Underscore, Video Game and Ambient music! 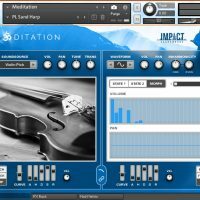 Meditation” is an inspiring collection of acoustic mallet, gong, and glass sounds combined with a revolutionary Kontakt-based additive synthesizer! 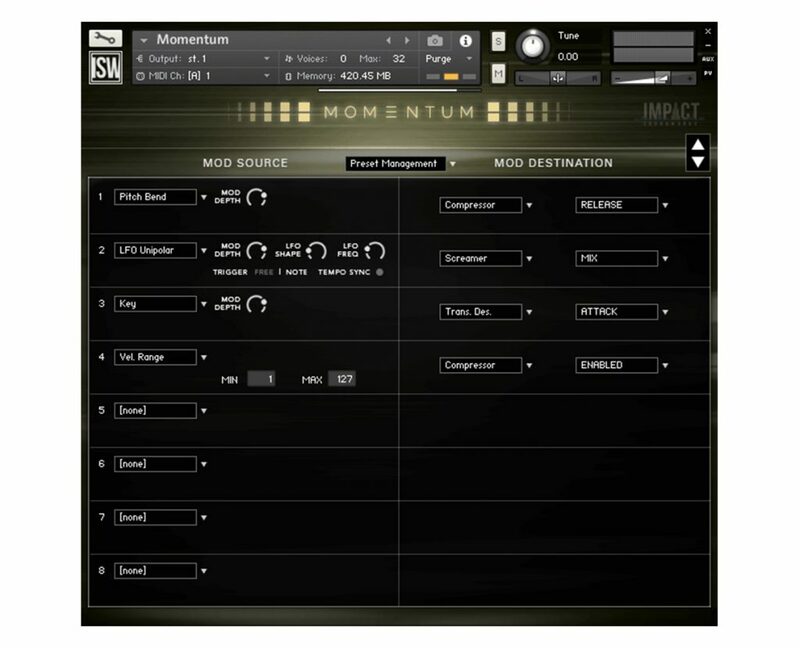 With both easy tweaking and advanced modulation design tools, you can create an endless variety of evolving and subtle tones, perfect for scoring, ambient and atmospheric music. 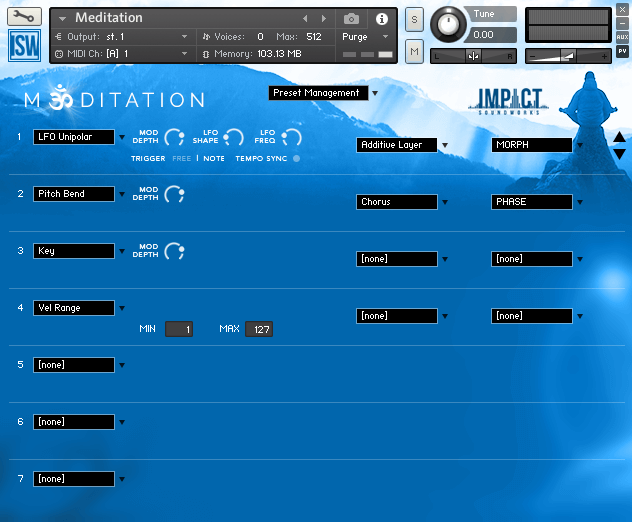 Acoustic sound sources include – Aquarion, Boltophone, Brass Urn, Crotales, Gamelan Ensemble, Glass Gong, Glockenspiel, Kenong, Koto Harmonic Pluck, Marimba, Muted Prayer Bowl, Pipe Harp, Pot Lids, Rubber, Mallets, Shou Drum Brushed, Stonaphone, Toy Piano, Tubular Bells, Vibraphone, Violin Pick, Waterglasses. Intel i3 processor, 3ghz or higher or equivalent. Want to learn more? Read the manual HERE. 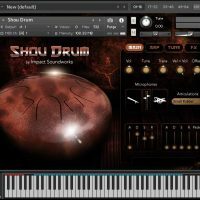 The ideal rhythm collection for film, TV & game composers: a treasure trove of 2,500+ truly unique, organic percussion performances, categorized and tagged with extensive sound design tools! 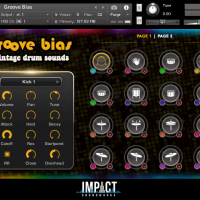 Impact Soundworks captured such sounds as mistreated bass drums, rare hand percussion, hammered guitars, slapped cellos, wine glasses, found metal objects, giant boxes, tiny blocks, and a treasure trove of other unique instruments. 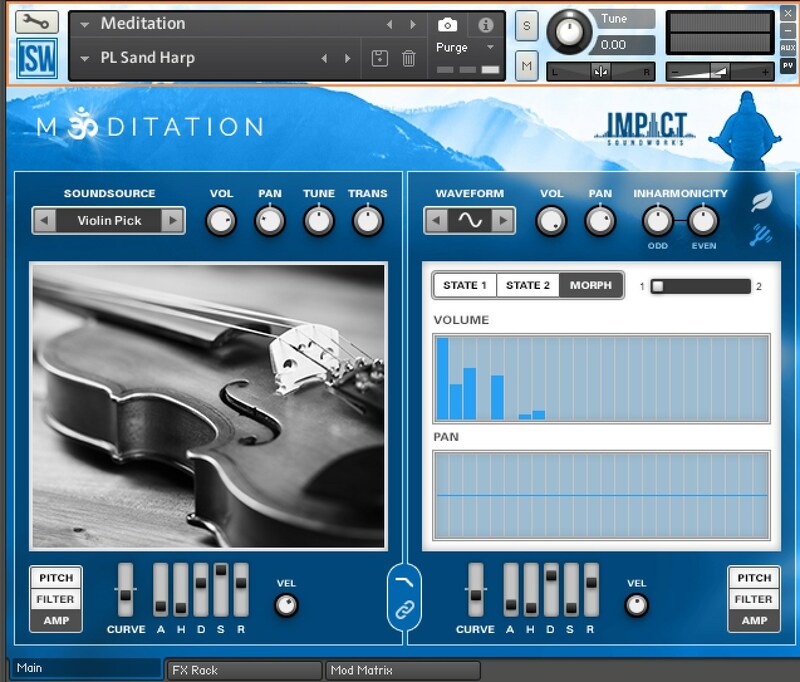 These sounds come from a diverse array of talented recording artists and sound designers, each offering their own distinct take on the challenge of organic, unexpected percussion! 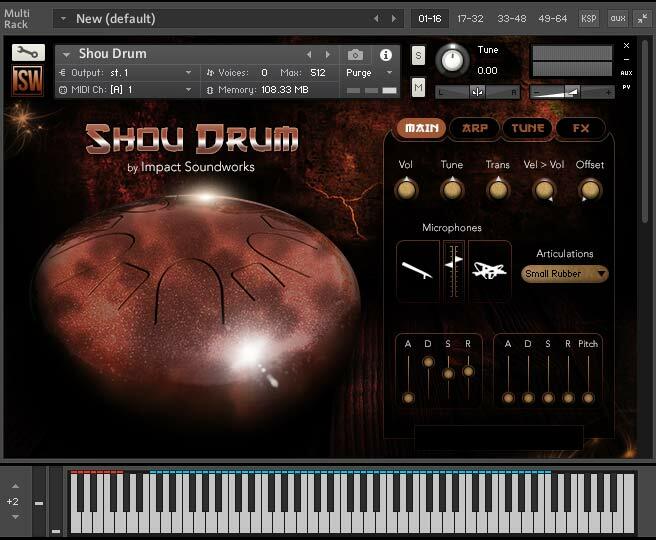 A beautiful tuned drum handcrafted from tempered steel and performed with a variety of articulations and mallets. 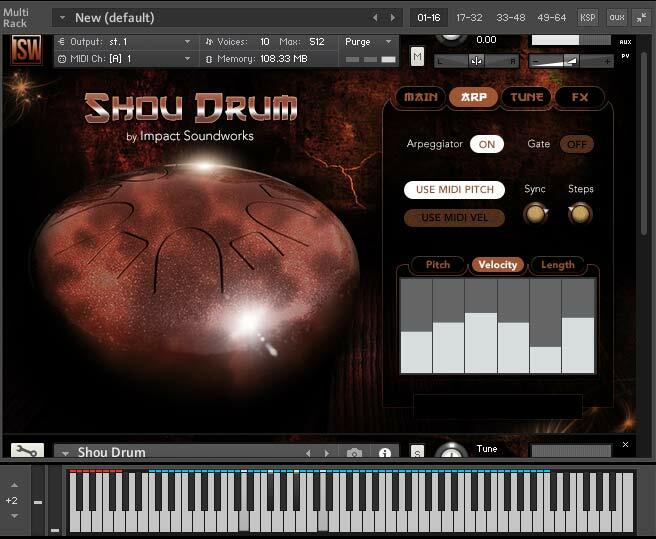 The Shou Drum’s pure tone is perfect for atmospheric music, film & game scoring, evolving textures, and ambient moods. 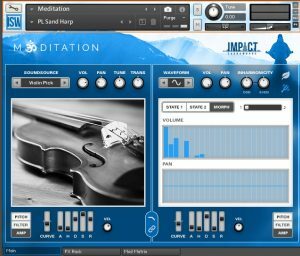 A wonderfully unique instrument sure to inspire your compositions! 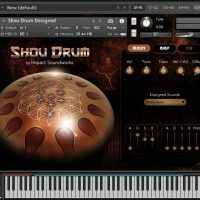 The Shou Drum features a classy, elegant interface offering key controls for tweaking the instrument’s tone, as well as some powerful sequencing features. 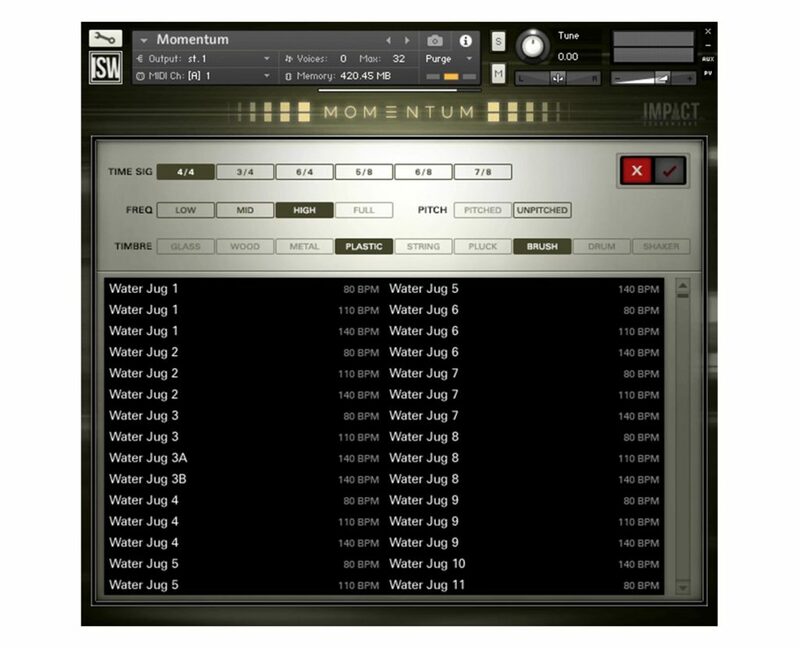 Volume, tuning, mic mix, transposition, and both volume & pitch envelopes can be modified from the main page. 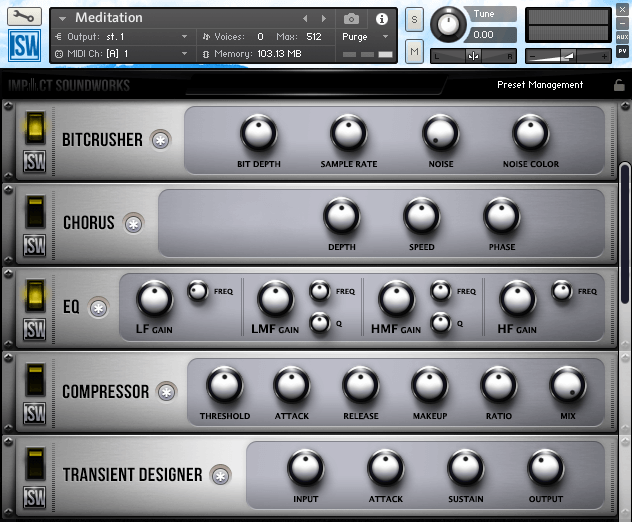 The other tabs offer a powerful combination poly-arpeggiator, sequencer, and gate, plus a custom microtuning engine, and a four-slot FX rack. Three hand-made traditional animal skin drums, exquisitely sampled with a deep, earthy and warm tone. Dynamics range from quiet to huge! Recorded in mostly dry environments, and ideal for world music, underscore, and even epic cues! 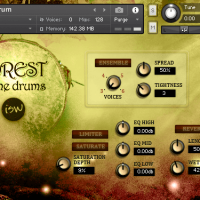 The Primary Forest Drum was recorded close in a naturally ambient space which adds a pleasant ‘splash’ on loud hits. The Deep Drum is naturally quieter, but even lower-pitched and bassier, as it was recorded very close. The Small Drum is the simplest of the three with a naturally higher pitch; great for accompaniment! 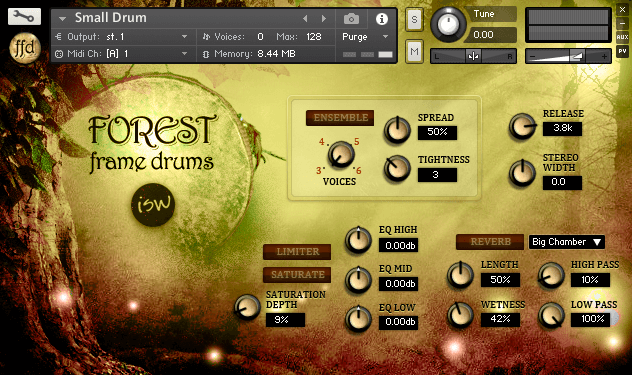 Forest Frame Drums also comes with a gorgeous UI for easy control and tweaking. 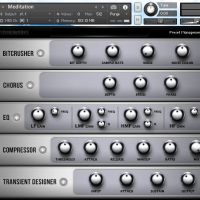 You can create an instant ensemble sound with one click, and change ensemble voices, width, and tightness (or slop). 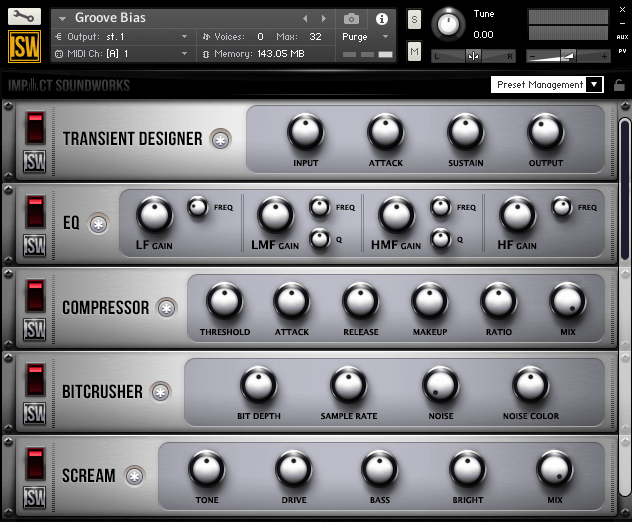 Built-in release control, EQ, saturation and limiting allows you to customize the tone and shape of each drum quickly and easily. Relive an era of classic drum sounds where funk was king! 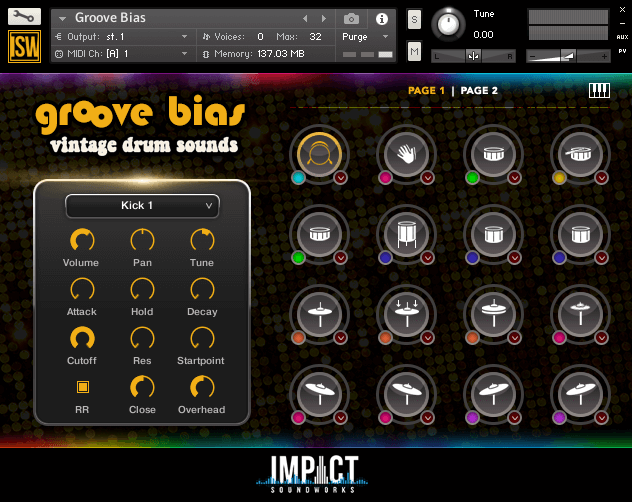 With three old-school drumkits recorded through all analog gear, tape, and vintage mics, you’ll never sample an old drum break again! 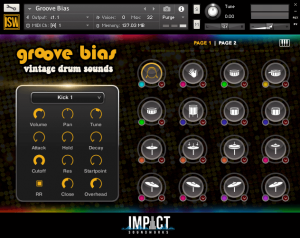 The goal of Groove Bias was to create a set of deeply sampled acoustic drum kits inspired by classic 50s, 60s and 70s records and the timeless breakbeats we all know and love. 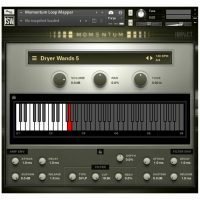 For decades, these sounds have been imitated and sampled over and over, but many producers have preferred to try and capture old kits with pristine, modern recording methods. Not so with this library. Soundworks’ motto was “the more tubes, the better,” and we armed ourselves to the teeth with beat-up mics, analog gear, vintage drums and tape machines. 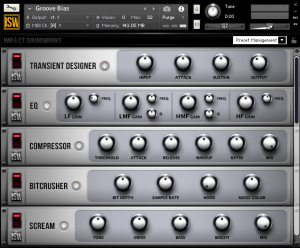 There are six main patches, eight special/alternately-mapped patches, and sixteen FX patches in all, totaling 73 articulations of extensively multisampled hits, scrapes, rolls, and designed textures. 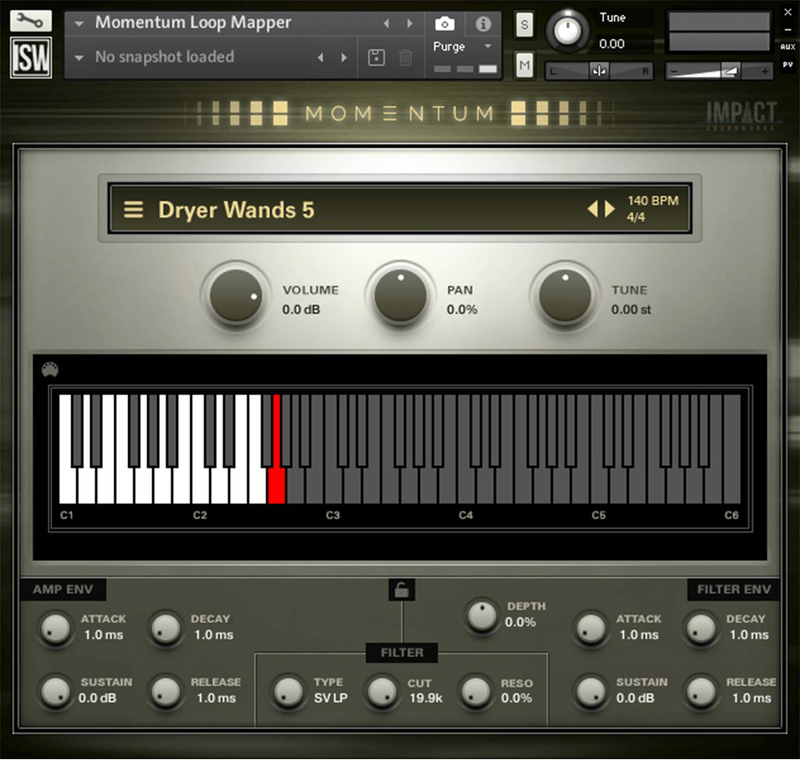 Impact Steel was designed to be as playable as possible, on both drum controllers as well as MIDI keyboards. 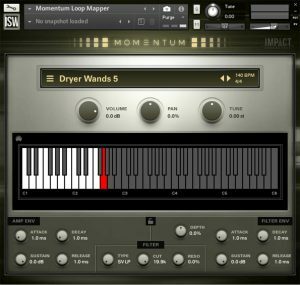 As such, all main patches are keymapped without overlap, and can be loaded on a single channel for instant playability of all instruments. 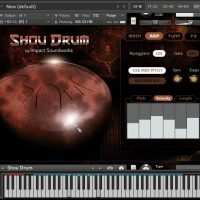 So What Exactly Can I Do With “Drum Bundle”? 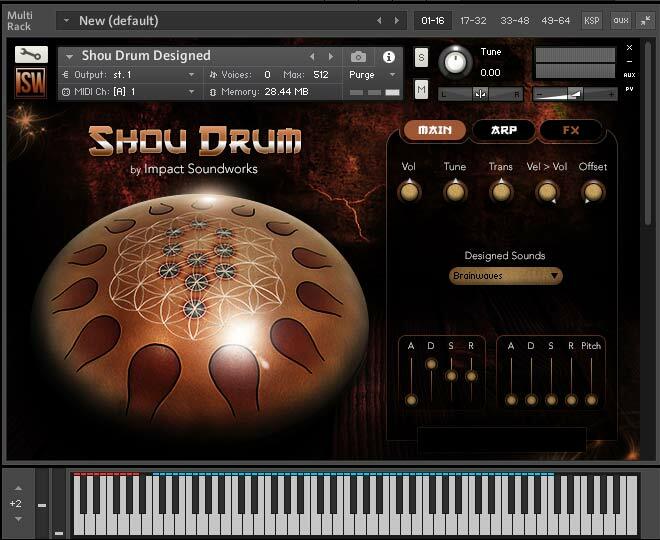 "With Shou Drum, Impact Soundworks deliver a deep yet intuitive tonal metal instrument that excels at arpeggiated patterns and hypnotic ostinatos making it a great tool for ambient tracks or creating unique textures." 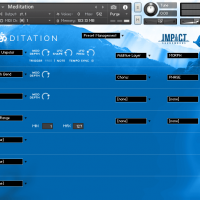 "Meditation is an uplifting compilation of an acoustic mallet, gong, and glass sounds combined with a synthesizer. 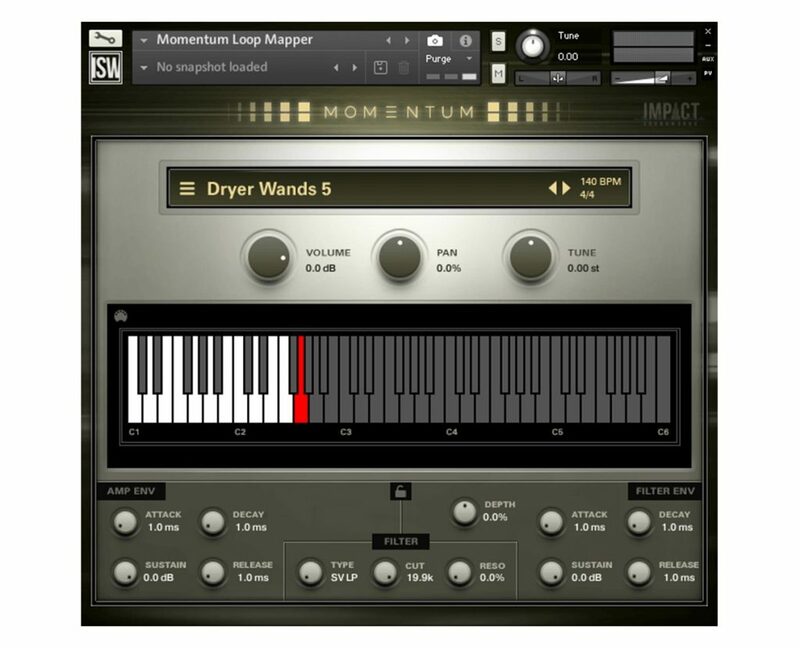 You can easily and fast create augmented sounds with their engine, the usability of the main page of the library is helping you to get results quickly." 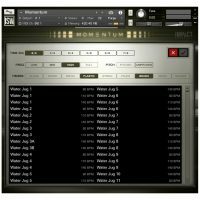 "Momentum boasts a vast array of top notch acoustic percussion performances from some quite unique sound sources. 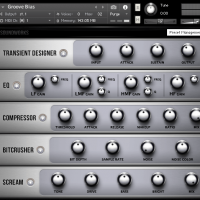 Presenting them as ready to go loops makes for a speedy and easy workflow, whilst the full-featured interface still gives plenty of scope for deep customization." "All in all, this is a great library. 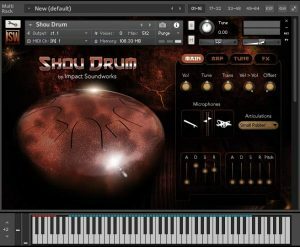 Well recorded, deeply recorded, and a very intuitive playability via the highly attractive GUI... and will make a great addition to your existing ethnic/hand percussion collections. I love them and can see myself reaching for them regularly, especially on days in the studio when my own playing is sloppy!" 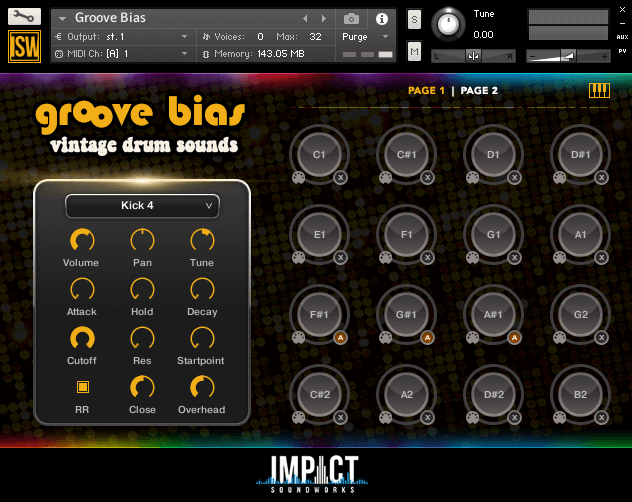 "Groove Bias is always my first choice for tracks that need serious amounts of funk and soul. 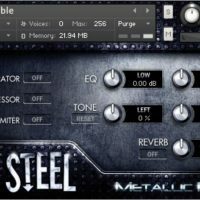 For years, I’ve been wrestling with general purpose drum libraries, trying to treat them to get that ultra-punchy 70s/80s sound. 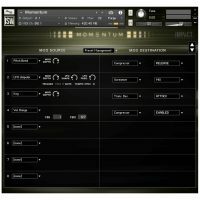 This can’t be overstated: the way the samples are recorded matters as much as your mixing techniques, if not more. After 10 minutes with GB, I was already slamming out breakbeats that sounded straight off an Earth Wind & Fire record. 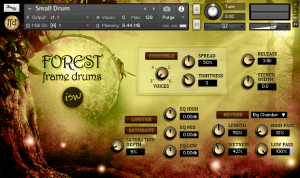 It’s amazing how well ISW captures that sound with almost no processing."